There are so many translator tools available in today’s digital era. While some may consider it contradictory to list Google as part of such tools, it is surely because of bad experiences they must have had with Google’s automatic translation service. However, for the purpose of this article, I’ll be dealing with Google Search, because it is an essential component of our core processes as translators – i.e. searching for reliable information and finding it in less time. Google Search is the number 1 search engine. We use it almost instinctively when searching for anything online. And it is no coincidence it is said to perform 2.3 million searches per second, that is about 100 billion searches per month and 2 trillion searches processed yearly. These figures illustrate how Google Search has become part of our daily routine, either as mere Internet users or as professional translators/interpreters (advanced Internet users). Moreover, with the advent of the mobile revolution, searching for information has become even easier. Even on the move, we can still perform quick searches on our mobile devices. Have you ever noticed Google Search’s “I’m Feeling Lucky” feature? It redirects you to a page considered the most relevant for your search query term(s). This option is available either from Google Search’s home page or within the predictive input text that appears when you type a portion of your search term(s). Instead of hitting the Enter/Go button, you can click this to access a page which is trusted by Google for listing interpreting jobs. As far as country-specific domains are concerned, they vary depending on where you live. Usually, Google services automatically detect your location via your IP address and redirect you to a “localised version” with supposedly more pertinent content. But, if you are not satisfied with the results obtained, you may broaden the scope by using the Google.com option. The All in One Solution? Among other things, you can use Google Search to check the weather in your location, get a live preview of currency exchange rates, define a word, convert several units (temperatures, lengths, volumes, etc.). Let us try by ourselves and see if this really works. In the Google search box, type weather in your city (e.g. weather in paris as illustrated below) and hit enter. You will have a live update of the weather in the desired location, plus a one-week forecast. If you are a US citizen moving to Europe, you might need to know the right volume of fuel your car will be consuming. It may be frustrating to realize people rather measure such volumes in liters. Don’t panic, just input number liters in gallons (e.g. 145 liters in gallons) and voilà! The same is true for other unit conversion, including distance (mile-to-kilometer conversion). From the previous search, you can change units to be converted. Just click the “volume” dropdown list to see other units available (see picture below). Go on now, and try it for yourself. Have fun converting among units and see how easy it is. Search operators are special ways of inputting search terms so as to return targeted results. These are similar to filters you can set to tell Google Search the type of results you need. Here are some of the most popular search operators, with corresponding examples. Search it, Find it with #Google search operators. When typing your search query terms, capitalization doesn’t matter (i.e. New York MLS and new York mls will return the same results). Target specific key terms for better search results (search for used car parts instead of typing old components from cars with 2 or more owners). Consider the Voice search option, especially when using a mobile device (you may need to fine tune your device’s voice recognition settings). For exact results, place your search terms in quotation marks (“”). Review your results in terms of numbers (how popular are search terms as formulated by you?) and authority of sources (how relevant are websites containing results? Are they primary sources?). Define the search category in advance and go to specific sections (Books, Images, News, etc.) of Google Search for better results. Have fun performing your searches. If not satisfied, try again until you find what you need/expect. All in all, it should be noted that you are ultimately responsible for the quality and suitability of results you choose. Always cross-check search engine results for suitability to your #translation purposes. Basically, search engines return indexed pages that supposedly match search query terms you enter. But always cross-check results from two or more authoritative sources to ensure a minimum of suitability to your purposes. There must be other tricks that you use to make Google search one of your best translation tools. I am eager to discover them. Feel free to share in the comments. 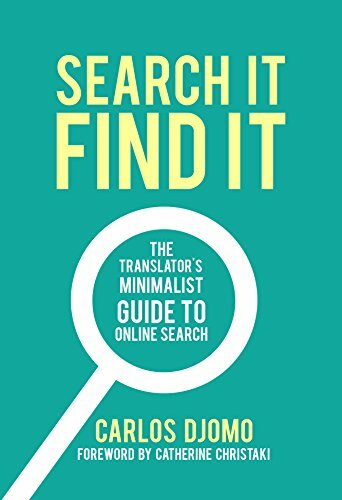 This article is a premium extract from my book, Search It, Find It: The Translator’s Minimalist Guide to Online Search. To buy a copy from Amazon, click here.